The software-as-a-service (SaaS) market appears to provide an easy opportunity for vendors to garner significant revenue and growth. SaaS is the largest segment of the cloud market - bigger than the infrastructure-as-a-service (IaaS) space, which draws so much attention due to leaders Amazon Web Services and Microsoft Azure. The SaaS market is also much more fragmented, littered with thousands of providers, which would seem to imply that consolidation is a foregone conclusion. However, even for three of the largest leading SaaS providers, the investment level required to compete in the space remains high, and even spending billions of dollars in R&D and acquisitions does not guarantee success. This is not to say that these billions of investment dollars are all for naught. Despite being around for more than a decade, the SaaS space remains quite immature. Customers are still figuring out which of their applications can be moved to cloud delivery, and how, when and with which vendors those moves can take place. Until a longer track record exists for making these decisions and vendors consolidate disparate offerings into packages more closely resembling integrated solutions, the market remains very much in flux. It’s not the functionality holding back the adoption of hybrid solutions, it’s the difficulty of integrating and managing the multi-cloud and multivendor solutions. In the meantime, vendors such as Oracle, SAP and Workday have no other choice but to continue accelerating their investments. Their dollars will not buy SaaS performance in the short term, but this is the only way these vendors have a shot as the SaaS space becomes more predictable. By virtue of its long legacy in a diverse field of software, Oracle finds itself in a unique position with cloud solutions. 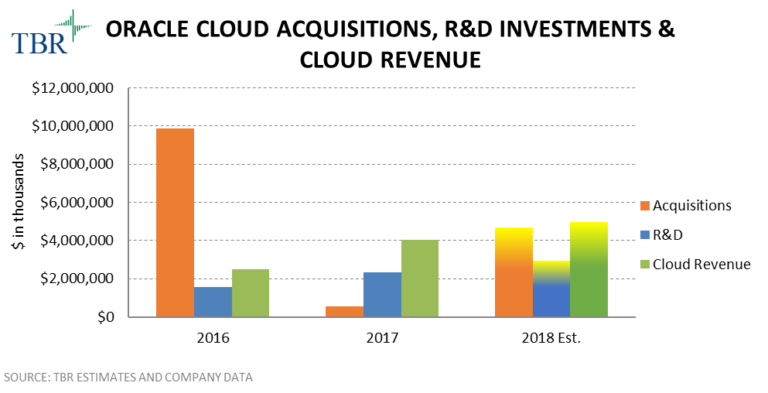 Aside from databases, Oracle is a company built on acquisitions, and that approach holds true with its expansion in cloud. After first downplaying the overall concept of cloud delivery, even while acquiring cloud assets, the vendor recently quickly shifted its messaging and doubled down on internal- and external-driven innovation. 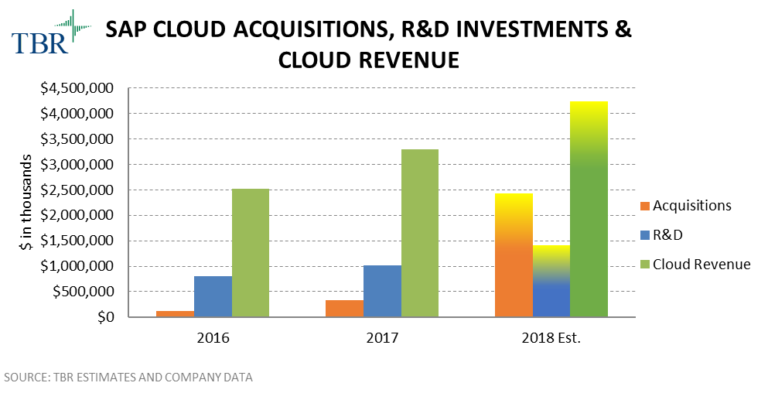 The results from a dollar perspective are laid out in Figure 1, representing a steady and significant stream of acquisitions focused on building out mainly SaaS offerings and R&D that funds cloud solutions across the spectrum of IaaS, PaaS and SaaS. 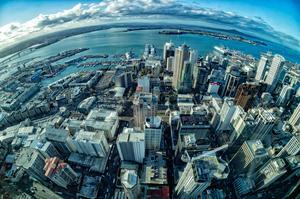 The significant amount of Oracle’s investments is undeniable, but the returns are far from overwhelming. The downfall of Oracle’s SaaS investment plans played out quite publicly, as the company first bet it would become the first SaaS/PaaS vendor to achieve a US$10 billion run rate, then recently changed its reporting structure midyear to blur the actual results. 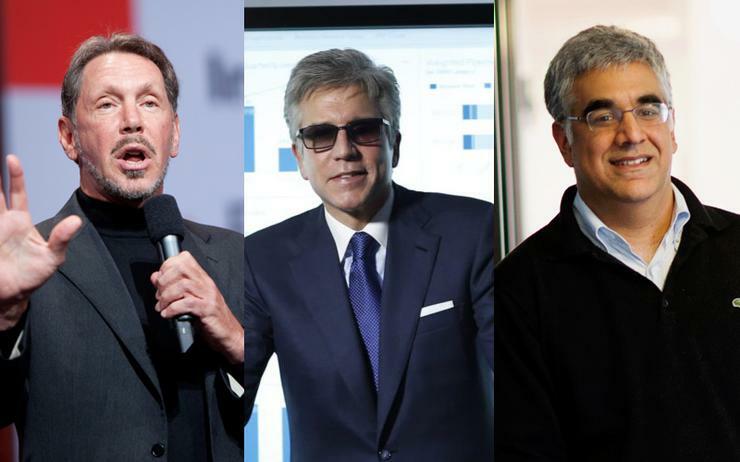 Oracle maintains worse performance than SAP and Workday for the return on its acquisition and R&D investments, spending more on these investments than the company generated in total cloud revenue during 2016, 2017 and 2018 (estimated). That does not mean Oracle is without successes, however, as the purchase of NetSuite, reflected in Oracle’s large acquisition expense in 2016, contributes to revenue growth and complements the organic development of Fusion Cloud ERP. A lot of Oracle’s struggles in cloud come from organic initiatives, such as its PaaS and IaaS services, which have not taken root with customers despite aggressive sales tactics. Those categories of services account for a significant portion of Oracle’s R&D investments over the past three years, but still generate relatively small revenue streams for the vendor. Nevertheless, despite the investment outweighing the associated revenue contributions, we believe Oracle will and should remain committed to its current cloud strategy. It may not pay off in the near term, but these investments are the best shot for Oracle to execute a longer-term cloud turnaround. Though still acquisitive, SAP’s cloud strategy has been more focused on internal innovation compared with Oracle. A more even mix of R&D and acquisition investments, combined with an earlier commitment to cloud delivery, is producing a better rate of revenue return for SAP, as shown in the graph below. SAP ranks fairly close to Oracle in total cloud revenue but is achieving those run rates after incurring significantly fewer R&D and acquisition expenses. TBR estimates SAP’s combined R&D and acquisition investments for cloud were $6 billion for the past three years, compared with more than US$21 billion for Oracle over the same time period. Despite the comparatively positive financial returns for SAP in cloud, the vendor is still struggling with multiple elements of its portfolio. After allowing Salesforce to capitalise on the shift to moving front-office apps to cloud, SAP recently started circling back to carve out territory in that domain. Through multiple acquisitions in the customer experience space and new messaging, SAP is making a concerted push, but it faces an uphill battle winning more market share in that space. 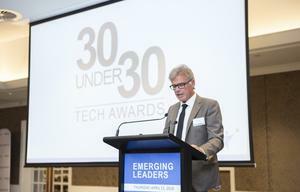 Furthermore, SAP’s effort with SAP Business Suite 4 HANA is a long-term one, and in the meantime, assets such as SAP Cloud Platform are underrepresented in the platform space. The net is that SAP has managed investments well and grown revenue in cloud but is still not achieving at a scale that ensures the vendor’s leadership in the SaaS space. Historically, Workday has been more reliant on internal R&D as the sole means of advancing its cloud strategy compared with Oracle and SAP. That certainly does not mean the company was shy about entering new markets or delivering new products, as Workday has rapidly increased its activities in both regards over the past three years. The addition of student, financial and now platform offerings illustrates how broadly Workday has expanded its portfolio beyond core human capital management (HCM) offerings. Part of Workday’s reliance on R&D comes from its core focus on a “single line of code,” which provides simplicity and consistency in the vendor’s offerings to customers. Integrating multiple offerings and services is part of the challenge with acquisitions, which Oracle and SAP know all too well. Workday’s past acquisitions have always been functionality-focused and intermittent. The company’s three acquisitions in 2Q18, including its US$1.55 billion purchase of Adaptive Insights, is a departure from that strategy but is likely not indicative of broader plans to acquire more fully baked applications. Workday Cloud Platform will allow Workday to leverage partner-developed, inherently integrated technology to expand portfolio breadth. The assumption that Workday’s acquisition-lite approach to investment would be advantageous is not necessarily true. 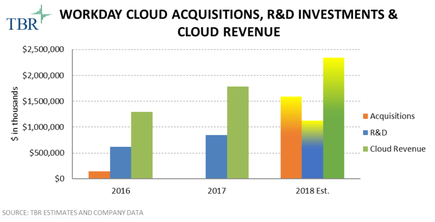 Even without significant acquisitions, Workday’s investment ratio (R&D + Acquisitions/Cloud Revenue) is higher than SAP’s for the three years from 2016 to 2018. Workday had a lower ratio than Oracle, which is spending aggressively on acquisitions, but Workday ranked above SAP in internal R&D investment level proportional to revenue. Additionally, Workday’s streamlined “single line of code” approach is not guaranteeing success in new product categories. HCM revenue growth remains strong, but Workday’s new expansions in Financials and Student are not seeing accelerated early revenue growth. The new offerings are certainly growing, but not at the rate one would expect given the strong HCM base into which they can be cross-sold. The large acquisition of Adaptive Insights could be part of a change in strategy to add inorganic revenue and could lead to greater cross-selling possibilities for the Financials business.